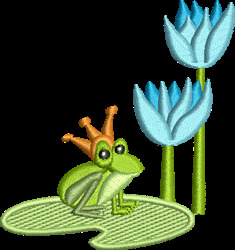 Enjoy a fairy tale with this froggy prince Charming design. Your little princess will love this on shirts, totes, and blankets. Great Notions is happy to present Prince Charming machine embroidery design which has 6646 stitches and is [71.63 mm x 7.37 mm] large. If you would like to view more embroidery patterns please search on our embroidery designs page.